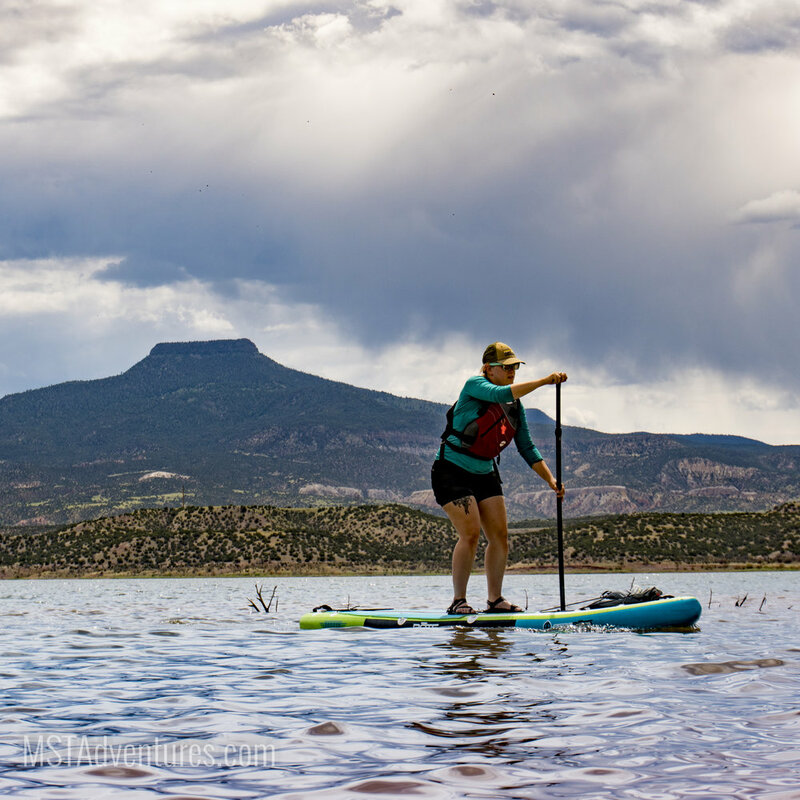 Rental SUP and PFD on Abiquiu Lake, Pedernal in background. Abiquiu, NM; Campsite and Sunset at Abiquiu Lake. We want you to have a great time, and would never send you out with gear we didn't like and trust. Our rental inventory is gear that we love. In fact, we often finding ourselves throwing it in our cars when we have time to get into our own adventures. We also know what a pain it is to wait around for a shop to open in the morning before you can get going. Our rental periods begin the evening before your selected date and end the morning after - at no extra cost. That's right, pick it up Friday evening, use it all weekend, then bring it back to us Monday morning for the same cost as a regular weekend rental. Click the "Book Adventure" button to schedule your rental today! Winter in New Mexico is a beautiful time to be outside if you ask us. The soft snow highlights the enchanting features of the state. With our snowshoe rentals we can help get you to those special places. We proudly carry MSR Snowshoes, strong, reliable, and easy to use, is what comes to mind when I think of our gear. We only rent the gear we trust and believe in, these are no different. All of our snowshoe rentals come with Atlas Adjustable "Lock Jaw" trekking poles at no extra cost. Is this your first time? Check out our blog on what you need to know before you go. 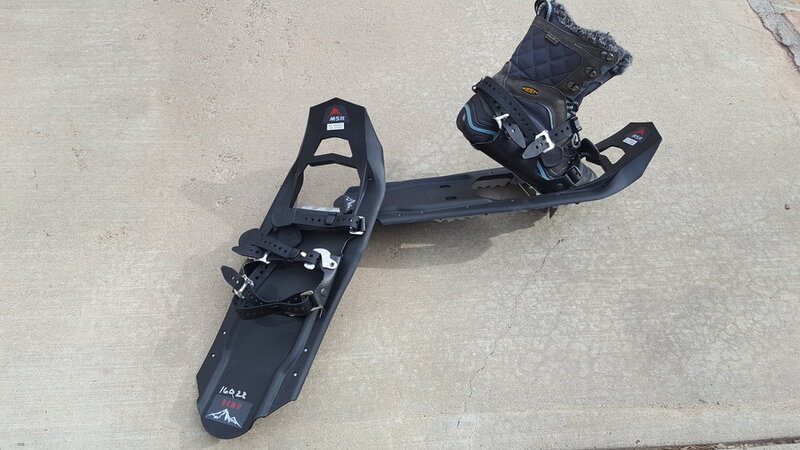 We carry the MSR EVO and EVO Ascent snowshoes for adults. The difference between the EVO and Ascent is optional climbing bar on the Ascent. Both come ready to add the tails if powder is in your future. The MSR Shift is for the young adult in the family. They do not accomidate the tails like the EVO's and Ascents do but will crush the trails on your next family adventure. The MSR Tyker, is for the youngest adventure in the house. These will accommodate a wide range of shoes sizes and will support that youngster up to 90 lbs. 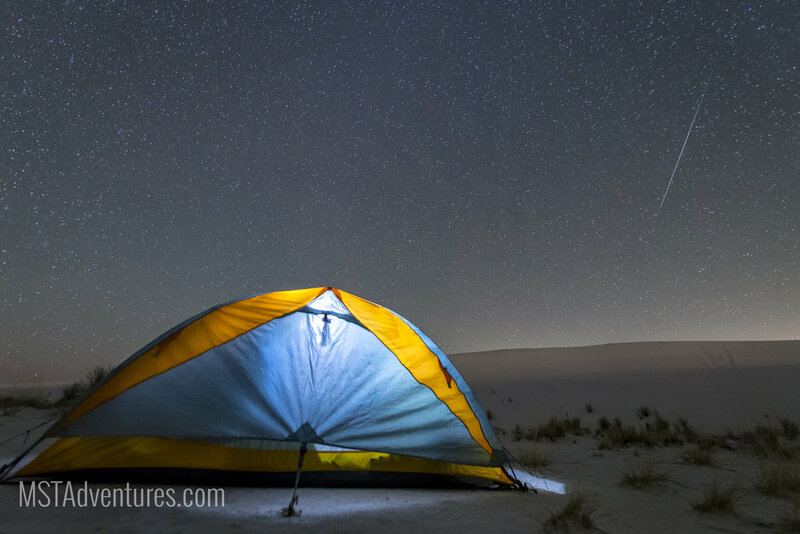 White Sands National Monument offers an excellent first-time backpacking experience - and a great view during meteor showers (like this Gemenid meteor captured in December, 2015). Our Family Camping Kit is hand-selected to make sure you have everything you need to enjoy the beauty of New Mexico (and beyond), even if you aren't the kind to stray too far from your car! Our backpacking kits let you take the adventure farther! High quality backpacking equipment from some of the top brands in the industry including MSR, Gregory, Osprey, and more! Are you looking to rent gear but not the whole kits listed above? Give us a call so we can provide you a custom rental for your outing. Our Whitewater kayak rentals are for the experienced paddler and our students. If you're looking for a boat to float through town, or you're not sure of the difference between a forward sweep and a stern draw, check out our selection of SUPs and Recreational Kayaks above. The River Runner, a kayak that can do it all from down river play to boofing large waves and holes for a fun day on the water. We carry Dagger Mamba's, Pyranha burns, and the Liquid Logic Mullet. - Our Kayak Rentals are for the experienced kayaker who has their own skirts and PFD. These kayaks are also used for our whitewater classes and our students are provided a skirt, PFD, and paddle. The Creek boats we carry are for the hard hitting action of big drops and rocks. We carry the Dagger Nomad for this action. - Our Kayak Rentals are for the experienced kayaker who has their own skirts and PFD. These kayaks are also used for our whitewater classes and our students are provided a skirt, PFD, and paddle. Play Boats are where the action is once you have your kayak roll down. There is no better way to improve your skills than to throw yourself into a hole to surf and try to link freestyle moves. We carry Dagger, RX, G-Force, and Jiu Jitsu. If your looking for old school, we also have a Liquid Logic Mullet. - Our Kayak Rentals are for the experienced kayaker who has their own skirts and PFD. These kayaks are also used for our whitewater classes and our students are provided a skirt, PFD, and paddle. Snowshoe rentals making the winter fun.